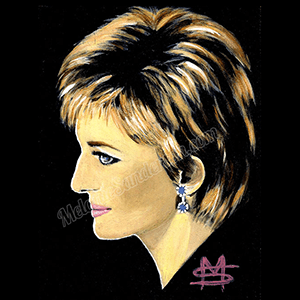 Melanie specialises in portraiture and is often known as ‘The Diana Artist’ since completing one hundred and one portraits of Diana Princess of Wales. The project spanned eight years and the portraits are painted on wood, individually framed. To commemorate the 20th anniversary of Diana’s passing; Melanie and American Composer Craig Cervantes collaborated on a project to bring their Music and Art together. Craig had written a symphony for Diana, and Melanie created a film of her portrait collection to his soundtrack. The two tributes have now been combined on DVD. A live multi-media orchestral concert to celebrate Diana’s life was then held in Southampton. Trailers from the film and from the concert can be seen below. We hope you enjoy browsing these galleries – thank you for your visit.